This 1874 map features the state of Florida with an inset of St. Augustine was originally produced by Samuel Augustus Mitchell Junior. The map border features a signature floral and ivy pattern that interlocks and weaves lazily around the piece. The Mitchells were among the most gifted cartographers in the 1800s. This original painting by Lisa Middleton is beautifully and intricately detailed. The 1874 map of Florida was produced to be prepared as a part of Mitchell’s New General Atlas, 1874 issue. The hand coloring of the state dividing line is evident, as well as shading around various bays and other portions of the coast. Darker shading indicates shallower depth along the coastline. This was a great aid to shipping merchants as they navigated the shallow waters that are all to familiar at various sounds and ports along the coast. The map does have a few peculiarities. For instance, there are references to “Indian Hunting Grounds”, and “Mangrove Woods”. Those two inclusions provide a time stamped looking glass of sorts that allow us to look at the world in a way that was much different then it is currently. The Seminole Wars had recently ended and the map still depicts some of the last remaining places that they Seminole had foraged for food. The “Mangrove Woods” are what we primarily know today as “Mangrove Swamps”. Most of these places require a small skiff boat in order to be accessed. Overall, this piece is simply a great specimen of cartography. It is absolutely some of the Mitchell’s finest work. The flora and fauna border hallmark, hand colored details, and poignant, descriptive references might as well be Mitchell trade marks. The 1874 Map of Florida is very “Mitchell” and very unique due to its historical significance. 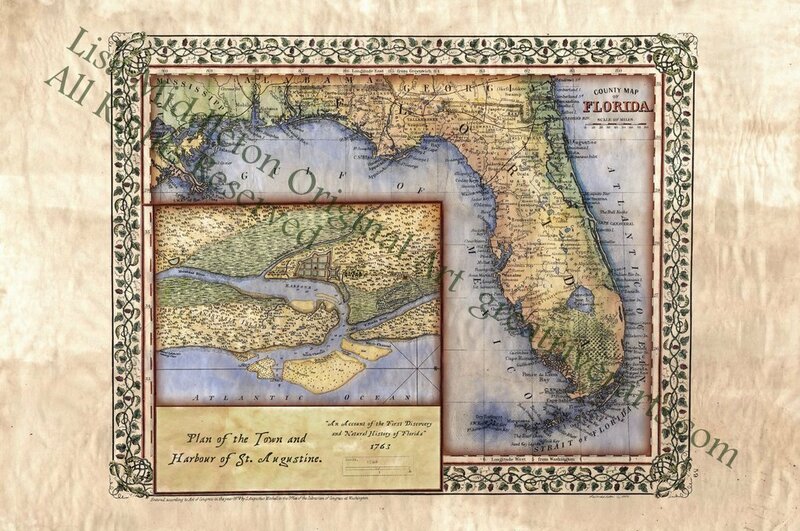 This entry was posted in Map Art News, New Map Announcements, Southeast and Eastern US and tagged Florida 1874, Samuel Augustus Mitchell Junior. Bookmark the permalink.